WASHINGTON—The White House Big Dig is finally wrapping up, but the Big Reveal is proving to be a pretty big letdown. Plus, if you ask what the next phase is in this massive, four-year project, the official answer is "TBD" -- to be determined. 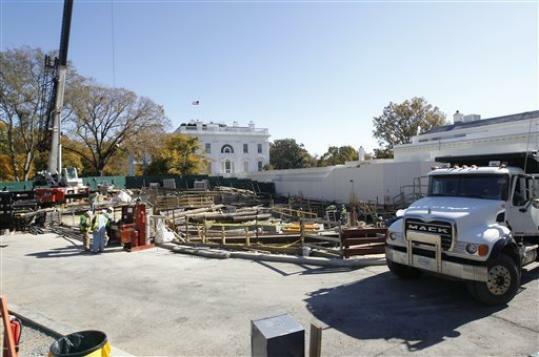 The construction project -- officially a long overdue upgrade of White House utilities -- began in September 2010 with the excavation of a huge, multistory pit in front of the West Wing, wrapping around to include West Executive Avenue, the street that separates the White House from the Eisenhower Executive Office Building. A tall, green construction fence sprang up that blocked America's most famous office complex from public view. However, what reporters and photographers saw during the construction appeared to go well beyond that: a sprawling, multistory structure whose underground assembly required truckload after truckload of heavy-duty concrete and steel beams. The GSA maintains this structure is merely "facilitating" the utility work. But neither the agency nor the administration will elaborate on its function. Last year, when the project began, GSA officials denied the construction was for additional office space or another bomb shelter. The existing White House bunker, known as the Presidential Emergency Operations Center, is under the East Wing and dates to the Roosevelt administration. The GSA went to great lengths to keep the work secret, not only putting up the fence around the excavation site but ordering subcontractors not to talk to anyone and to tape over company info on trucks pulling into the White House gates. Meantime, for most of those who work in the West Wing, the project has been a huge headache. Sometimes literally. It's meant shouting to be heard over jackhammers and backhoes, and long walks on arching ramps to circumvent the extensive work zone. The GSA even built a temporary concrete-and-steel platform to elevate TV reporters and their cameras so the White House North Portico could still be seen over the fence. The platform, like the fence, is now gone. And no one's happier than West Wing denizens whose windows were blocked off. "Now that the sights and sounds of construction workers and their equipment are gone, my outlook on the North Lawn of the White House has, literally, brightened," said deputy press secretary Josh Earnest. But the respite may be short-lived. Future phases of the project, whose total price tag tops $376 million, are expected to involve more excavation elsewhere on the North Lawn -- the well-groomed park that tourists see from the fence on Pennsylvania Avenue -- and possibly inside the East and West wings. GSA officials say wrap-up work is actually continuing on the underground utilities, albeit out of sight. And they resolutely refuse to identify the next major work area, or to say when that construction will begin. "The scope of any additional work in the West and East wings has not been determined, so the timing, obviously, hasn't been finalized," said agency spokeswoman Mafara Hobson.